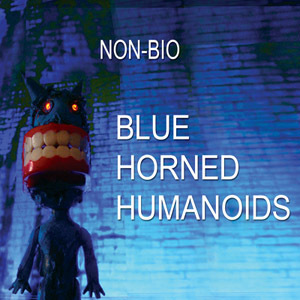 Blue Horned Humanoids is the first album released by Non-Bio, via Mrs.Vee Recordings. You can of course also buy it on CD, courtesy of Burning Shed. The title Blue Horned Humanoids is a reference to the 1980s computer game Elite. Since this was conceived as a multimedia project, I aim to make videos for several of the tracks; as I add to the video collection I will post links below. The opener is an atmospheric instrumental piece inspired by classic film and video game soundtracks. Possibly the scariest thing I've recorded in a long while, this ambient-ish track is an experiment in sampling gone horribly right. A no-holds-barred bleepy dancefloor stomper. I'd pay good money to see someone wasted enough to try dancing to this one. 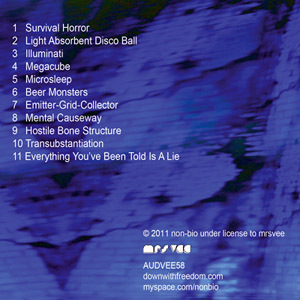 A change of pace here as the album draws to wards its close; recorded almost entirely using circuit-bent electronics, this track is best described as dark ambient. Well it is. Lies, all damned lies.